Over three months ago I blogged a post about having an almost quarter life crisis and how that felt. It was putting a strain on my life and adding a lot of stress. The notion that right now is not important and that the future is really where I need to be looking has plagued me over the days, months, and weeks since that post. I keep finding myself thinking, "It will get better in the future. Things will be great when this and this happen." Turns out I've been lying to myself. While it's not bad to have dreams, goals, and aspirations, it is bad to neglect the blessings of life at the moment. And it's taken me months of agony, a house group conversation, an unexpected forwarded email, and a hashtag to make me realize that. To explain: Over the last few weeks I have found myself wishing time away and has it ever been fleeting. To a point that, this past weekend is all but a blur to me. There are so many to-do's on my list, so many daydreams of what the future could be, that I am getting lost outside of the moment. I'm just not enjoying what life looks like now. For instance, I have a huge desire to move away, to get out of town for a few years, if not for the long term. Because my eyes are set upon the day that might happen, I am not forming a community, sinking my roots in and letting them prosper. Husband and I are not taking advantage of the beautiful place we live, aiming to enjoy this short time of life in small town Virginia. The truth of it all, is that we may never move. Or it may be years upon years before we do so. The plans that I am so strongly holding on to for our future are only written in pencil, while God's plans for us are firmly written out in ink. And I don't know what that looks like. So while asking for prayer during our Sunday night house group, I asked for prayers for contentment, to cherish time, and accept the place we are currently at. 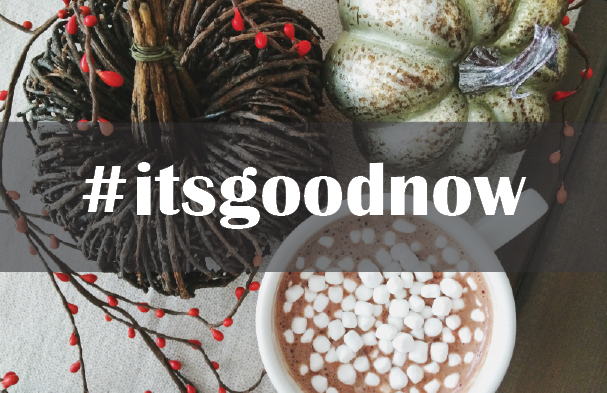 Just as we were about to move on to the next person, the wisest words were spoken about a simple hashtag that serves as a great reminder for loving, accepting, and welcoming the moment, #itsgoodnow. It gave me goosebumps. It was exactly what I needed to hear and it has been a strong voice in my head this week. Did it ever feel like God was moving in my life, like his hand was reaching down in that instant and resting upon my shoulder. I was so powerfully reminded that He's always there, I just have to be willing to listen. The Great I Am works in such unexpected and beautiful ways. So, I'm working on my attitude about life now. About being aware of the blessings big and small that I have been missing because my mind is elsewhere. 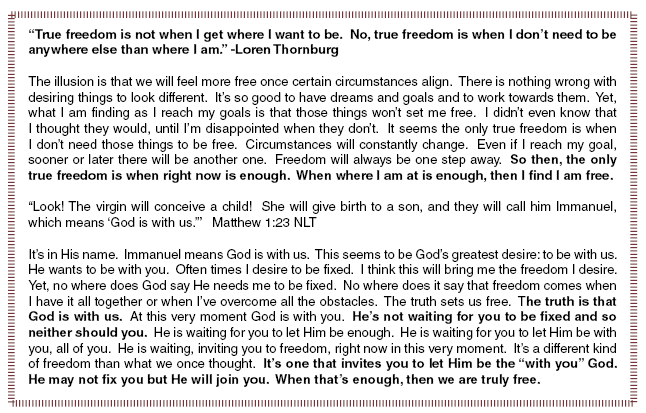 God will use this time in our life for His glory, to get us to where we are going. And with a Lord who calls me His own, I can rest assuredly in the path he has prepared for me.